In July 2016, Kurdish artist and journalist Zehra Doğan was imprisoned for her problematic art and social media posts that were harshly critical of the Turkish government and the abuse it has inflicted against the Kurdish population. 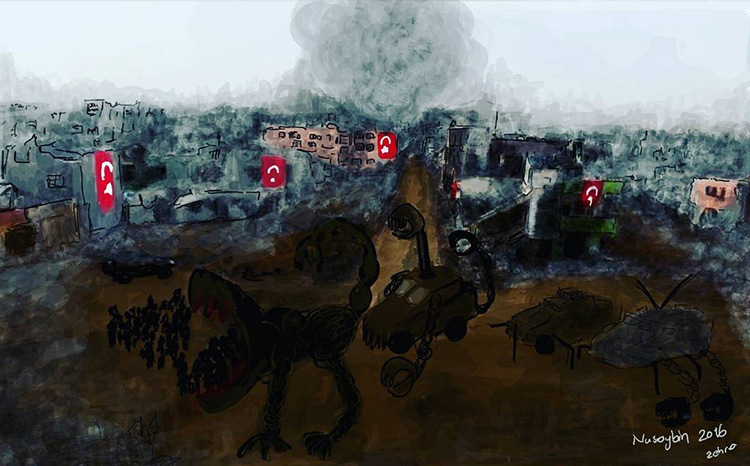 The disputed work is a painting (pictured above) that depicts the violent curfew that was imposed on the Kurdish town Nusaybin in 2015, showing an area of destroyed buildings and a line of the townspeople walking into the mouth of a scorpion-like machine. Turkish flags decorate the buildings, indicating that the destruction of the town was unquestionably at the hands of the Turkish state. In addition, she took to social media to cover the violent interactions between the Turkish security forces and youths from the Kurdistan Workers Party (PKK). She was charged with affiliation with a terrorist organization and the creation and propagation of PKK propaganda. Although her trial ended with no sentence given, she was kept in jail until early December that year. Her trial recommenced on March 2, 2017, where she was rearrested and charged for her controversial social media posts. She was given a prison sentence of 2 years, 9 months and 22 days which she would spend in her home town, Diyarbakir. Despite her confinement, Doğan still manages to not only create art with extremely limited supplies, but also smuggle her paintings and written works to the outside so that they can be published for the rest of the world to see. The book Eyes Wide Open: Journal of a Condemnation, Chronicle of an Exhibition is a collection of excerpts from her letters and journals that she has written in prison. She discusses the dismal conditions in which she lives, and describes the ways in which she creatively utilizes non-conventional tools to create art, such as crushing parsley and olives to paint with her fingers. Doğan’s continued struggle is a reminder of the persecution that artists continue to experience due to the repression of freedom of speech in Turkey. The Kurdish conflict has endured for decades, and it seems that the government will not cease anytime soon in its extensive efforts to silence voices that advocate for the Kurdish minority. Featured Image: Zehra Doğan’s artistic rendering of a state-taken photo of the Kurdish town Nusaybin.